I have an idea I’d like to offer for consideration. I propose that increasing ideological diversity in academia may be insufficient to break the tribal moral community it has become, and insufficient to adequately improve social science. 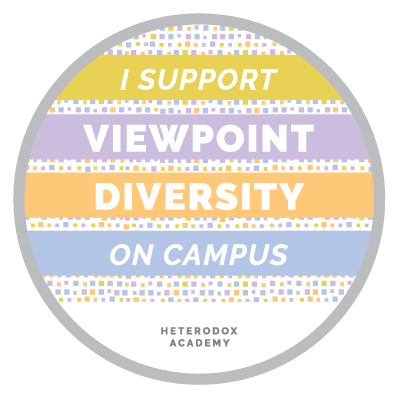 Heterodox Academy is a step – a huge leap, really – in the right direction, but additional steps are necessary. I propose that a deeper cause must also be rectified. Any effort to increase ideological diversity will, eventually, encounter this deeper cause. Sooner or later it will have to be confronted. It may as well be sooner. The idea I describe in this letter is one of my Eight Challenges to Moral Foundations Theory. I further propose that Moral Foundations Theory as it currently stands is insufficient to explain all of the ideas and behaviors we see in academia, modern American culture, and other ideologies past and present. Moral Foundations Theory alone does not fully explain, for example, the cognitive distortions described in The Coddling of the American Mind; it doesn’t explain the split between a) the thinking behind Social Justice Warriors like those in the Occupy and Black Lives Matter movements and b) the rest of leftist thought; it does not explain Victimhood Culture. A comprehensive theory of morality will have to be able to explain all of those sorts of things, and more, will it not? Culture of local time and place is a product of all that came before it. Culture evolves. Every action is a reaction to a previous action. Culture and the psyche make each other up. The description of the origins of Victimhood Culture seems to rely heavily on these concepts. This is not the missing piece of Moral Foundations Theory. I propose that the missing piece of morality that will help to make Moral Foundations Theory complete is cognitive style. Cognitive style is much more than simple personal preference. It is not merely a matter of “taste” for certain moral “cuisines.” Rather, it is a specific way our brains connect the dots of the bits and bytes of information they receive in any moment in time, and cumulatively throughout our lives. Cognitive style is one of the many “evolved psychological mechanisms” from which morality and ideology are constructed. The two brain types, or cognitive styles, or styles of thought, predate all known ideologies, past and present, by thousands of years. This suggests that cognitive style, like the Big Five personality traits and the moral foundations, is an evolved characteristic of human thought, action, and morality. * The final two pairings are italicized because they ALSO denote modern ideologies. This naming is unfortunate because it can cause us to conflate and interchange cognitive style with ideology as if they were one and the same when in fact the two are very different things. In Chapter Three of his book A Conflict of Visions Thomas Sowell discusses the two cognitive styles separately from the unconstrained and constrained ideologies of which they are parts, respectively. That chapter is titled “Visions of Knowledge and Reason.” The reader is asked to try to keep in mind that the unconstrained, constrained, liberal, and conservative cognitive styles are different phenomena from the ideologies that bear the same names. By any name these two cognitive styles have dominated human thought and have been seeds of human discord for millennia. I propose that academia is, for all practical purposes, a hegemony of the first of the two styles of thought; the style described by the collection of ideas encompassed by the left side of the above listed pairings. There are abstract-reason based WEIRD rationalist Platonic idealists on the right (i.e., binding) side of the two dimensional space, and there are experience based holistic intuitionist Aristotelian empiricists on the left (i.e., individualizing) side. Despite the presence of rationalists on the right and intuitionists on the left, there’s a correlation between cognitive style and the number of moral foundations one employs. The more moral foundations (i.e., intuitions) one employs the more one tends toward the holistic Aristotelian Intuitionist side of the two dimensional space. The fewer moral foundations one employs the more one tends toward the WEIRD Platonic Rationalist side of the two dimensional space. the cause is cognitive style and the effect is the mix of moral foundations. My rationale for this idea is, in a nutshell: reason-based choice, and naïve realism. This manifests in at least two ways. Consciousness seems like a “not invented here” mentality in which we place disproportionately high faith in the self-generated thoughts that we “feel” in our “selves” and disproportionately low faith in thoughts of others, past and present, that we don’t “feel” because they are external to our selves and therefore seem detached, abstract (here’s a different description of naïve realism). Ideas we come up with ourselves feel right, but we have to be convinced of ideas thought of by others including, and often especially, the collected wisdom of the ages. We use whichever of these seemingly contradictory tools of naïve realism and reason-based choice that best fits the current circumstance. But either way, technical knowledge and conscious reason always get the benefit of the doubt and all other sources of practical knowledge and the collected wisdom of the ages in its many forms gets only doubt. We humans have been around long enough and are seemingly smart enough to have learned from experience that some things work and other things don’t work, even if we can’t quite put our finger on why; and to have learned that no single human brain has the capacity to contain all of the facts nor, even if it did, has the capability to process all of them, but that human society itself, in which each individual brain past and present is like a synapse of the collective brain of civilization, actually has figured out some things. Supremely arrogant beings, are we not? In another post I called this form of bias The Reason Delusion. A better name for it might be The Consciousness Delusion. I see it as a distinctly different phenomenon from The Rationalist Delusion. The rationalist delusion would not be possible without first presuming that our own conscious awareness and thoughts provide more and better ideas than that of our “common” sense (e.g., the evolved psychological predispositions that make it easier for us to like butterflies than spiders and snakes, i.e., the moral foundations) and the collected knowledge of society itself (in business sometimes called “corporate” knowledge). The Consciousness Delusion is a prerequisite for The Rationalist Delusion. Because of The Consciousness Delusion – cognitive bias by which conscious awareness and thinking overrules all other forms of knowledge – Western culture to this day is still deeply, blindingly, entrenched in the “two-hundred-year tangent” of the rationalist delusion. It is the consciousness delusion and its sister syndrome the rationalist delusion, possibly more than but at least equal to, moral foundations and local culture of time and place, which explains cognitive distortions, Victimhood Culture, and the mindset of Social Justice Warriors like screaming Yale girl. It is the root cause of “Dead White Men” mindset, in which we eschew all sources of knowledge and wisdom in favor of our own reasoning. Through the cognitive bias of The Consciousness Delusion the rider really does, in a way, seem to control the elephant. The bias for consciousness is an intuition, a flash of affect, that can change the path our elephants follow. I suggest that we crossed the Rubicon to the cognitive bias of conscious reasoning around the same time that we crossed the Rubicon to shared intent. Because of this cognitive bias there’s a strong, natural, feel-it-in-your-bones, sort of appeal to the abstract-reason-based WEIRD rationalist, idealist, naïve realism, cognitive style. This appeal and its consequences are mitigated sometimes but not always, and somewhat but not completely, by the “intuitions” of the binding foundations, which tend to pull one’s thinking toward the experience-based holistic intuitionist, empiricist, epistemologically more humble cognitive style. The abstract-reason-based rationalist, idealist, Platonic, WEIRD, technical knowledge trusting, Cognitive Style is a great analytical tool that has helped to advance mankind’s knowledge and understanding of itself. On the other hand, people who are Social Justice Warriors, current campus protesters, and members of the Victimhood Culture generally, who seem to be also liberal, seem to lean heavily toward, if not think exclusively with, the reason-based WEIRD Platonic style of thought. I think its unfair to lump Social Justice Warriors with the other liberals listed above. What separates the two groups, both on the left, is cognitive style. As a conservative I find it not only easy, but enjoyable and productive to engage in conversation with Aristotelian liberals like the individuals listed above. I imagine I’d have a similar experience were I to converse with any of the folks at Heterodox Academy who also happen to lean left. But through the conversations I have had with Aristotelian leftists I’ve learned that even they often find it next to impossible to deal with the “logic” of social justice warriors, or have meaningful conversations with them. 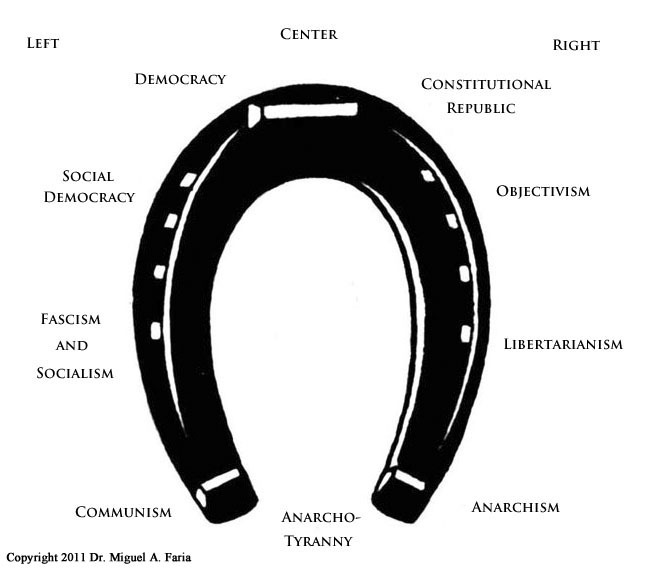 (1) A clarification of the two-dimensional ideological space described above: It might be curved. It might be less like a flat plane and more like a cylinder. Or maybe it’s like the following image (from here), which could be construed as viewing down the tube of the cylinder from above. (2) I’m aware that “critical thinking” might be a loaded phrase that has a negative connotation for some. The reason for the negative connotation seems to be the fallacious notion that through teaching people to think critically we can de-bias them; turn them into logic machines like Star Trek’s Mr. Spock. In this sense, trying to teach critical thinking is similar to Haidt’s description in The Righteous Mind of trying to teach ethical behavior. He says “Nobody is ever going to invent an ethics class that makes people behave ethically after they step out of the classroom. Classes are for riders, and riders are just going to use their new knowledge to server their elephants more effectively.” (The Righteous Mind, page 95) I’m under no illusion that after receiving training in critical thinking people will be like Mr. Spock when they step out of the classroom; able to use pure unbiased logic to see the truth. But we do know that a great number of cognitive biases and logical fallacies are built-in to human thinking. And disciplined methods or processes of organized thinking like Cognitive Behavioral Therapy, and training in proper argumentation, identification and use of evidence, and the most common logical fallacies and how to avoid them, can go a long way to avoiding some of the worst and most typical traps of the cognitive biases we humans typically fall into.